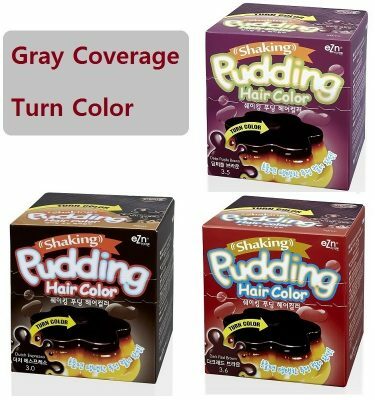 Pudding Color #5.4, #6.1, #6.4 Limited time only. Water to Gel System! Pudding can do more than what you believe! Now, easy and clear coloring is possible with this groundbreaking, innovative method! 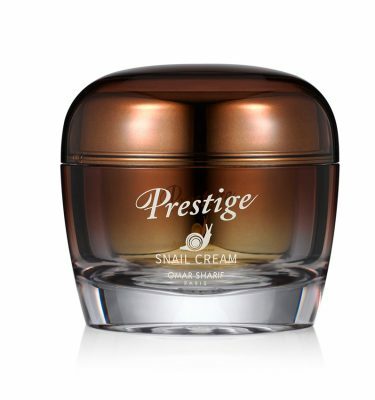 Through smooth gel-type cream, it offers vivid and full coloring effects by delivering hydrolyzed silk, hydrolyzed keratin and hydrolyzed collagen to continually provide luster & sheen. Simply stated, color effortlessly with pudding!! Pudding can do more than what you believe! Now, easy and clear coloring is possible with this groundbreaking, innovative method! 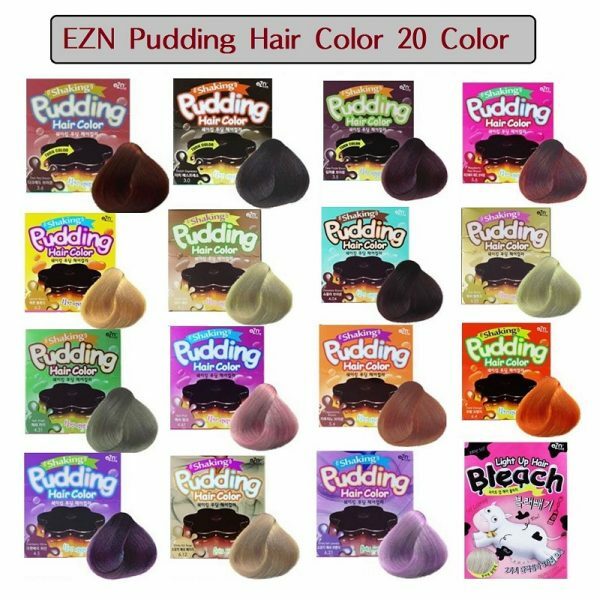 Color effortlessly with this hard-to-find pudding-like gel cream by Korean brand EZN that offers vivid coloring + sheen by delivering hydrolyzed silk, hydrolyzed keratin + hydrolyzed collagen to each strand, with no ammonia. Simply mix equal amounts colorant (#1) + developer (#2) in the provided plastic container, shaking horizontally until the mixture turns to gel and apply! First, wear gloves before starting the coloring session. Pour an equal amount of #1 (colorant) & #2 (developer) into the provided plastic container and close the cap until you hear the click sound. Mix well by shaking the container horizontally or sideways until the mixture turns to gel. (Do NOT shake the container vertically or up & down). Carefully open the container from the side and scoop the contents on hand to start the procedure. Use appropriate amounts as you color by sections. To apply the gel to the top, sides, and the back, gently rub the gel against hair. With the remaining gel, lightly apply along the hairline to finish the procedure. Wait according to the indicated time for the color to process (20 min. to cover gray hair, 30 min. to change the hair color). After the desired color is obtained, wash and rinse several times with lukewarm water until water runs clear. NOTE: Leave extra 10 min. if the coloring procedure is done at cool temperature (below room temperature) and/or for thick hair. Keep out of reach of children. This product contains ingredients which may cause skin irritation on certain individuals and a preliminary test should first be made. This product must not be used for dyeing of eyelashes or eyebrows. If you were to do so, it may cause blindness. When product comes in contact with eyes during the coloring session, rinse immediately with cool, running water and consult a physician immediately. Processed color may be different from the color chart indicated on the box due to condition of individual, hair, and/or temperature. Before coloring, please read the instructions thoroughly.